Every commuter fears hearing the tannoy announcement that their train journey will be delayed. And the fact that this is often attributed to ‘leaves on the line’ seems incomprehensible. How could leaves possibly cause a problem for a massive passenger train? Can’t the rail companies just sweep them away with a leaf blower or something like that? This very real problem costs the networks and train operators £50 million per year in treatment and pay-outs to delayed customers. The technical problem is that fallen leaves act like a Teflon layer that sticks to tracks. A train has a small point of friction between the wheel and the track to make it efficient when moving but this means that braking can be unpredictable. For 20 years jet washing carriages have been used as a main line of defence, but they are only effective until 12 trains have travelled along the track, then delays re-occur. We asked ourselves ‘what if?’ Perhaps we could use Microwave energy (at 121 times that of your domestic microwave), focussed onto a very small area to target the water molecules and change them from water into gas. 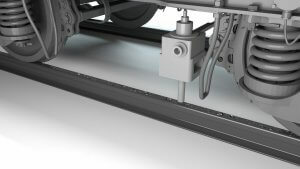 The idea is that this has the effect of removing the slippery layer from the rail head so that predictable summer-style braking can be achieved all year round. The technology prototypes have proved promising and now we are moving to larger scale development. We make products and experiences, unlocking fresh possibilities for individuals and organisations. 30 years of expertise design and engineering enable us to re-imagine tomorrow, today. The TEN difference: Re-imagining the potential for better commuter journeys.